William Shakespeare left a remarkable wealth of poetry and plays, which continue to be read and performed. His life has been of keen interest to scholars, some who dedicate their entire field of study to all things Shakespearean. The English language owes many of its familiar phrases and terms to the Bard of Avalon. His treatment of the English language helped drive its evolution. Shakespeare lives large in literary history, but as remarkable as he was he was a mortal man. He lived, he wrote, he died. What if the man we think of as William Shakespeare was more than a mortal man? What if he was a vampire? 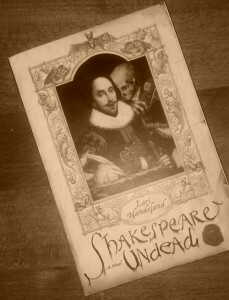 And so it is in Lori Handeland’s Shakespeare Undead. With threads from many of Shakespeare’s works, Handeland weaves together a tale of the vampire bard inspired by his experiences, the ghosts of the dead, and imaginings both familiar to popular culture today that hint at a possible undying writer’s continued contributions. In this tale we meet a Shakespeare struggling to find his muse. Of course, once he does things become more interesting than he bargained for as he meets Kate. In her we see the embodiment of the dark lady, the fair youth, and qualities of other characters penned by the Bard. As if romance wasn’t complicated enough, there seems to be a zombie invasion stirring up rumors of the plague. Handeland plays with ideas, twisting them and weaving them into a fun, quirky tale. Shakespeare is given an unlife full of twists and turns that are familiar and yet manage to be surprising. Best of all the end is not the end because there is a sequel, Zombie Island, which I personally look forward to reading. What do you think about the idea of Shakespeare being a vampire?